That may be one of the best lines I’ll ever read introducing a character. Sunny is many things. An American girl growing up in Nigeria, the daughter of two Igbo parents. An albino. And as she discovers early in the book, a Leopard Person–also known as a witch. Akata Witch is Sunny’s story, how she learned she had magical abilities, how she was embraced by a world she never knew existed, and how she found her place in that world with the help of some friends. I am reminded of the Doctor Who episode “The Doctor’s Wife,” when the Doctor tries to explain that they have entered a place that is not in their universe but it is like a soap bubble on the edge of a larger bubble except it is nothing like that but if it helps you to think of it like that then it is exactly like that. 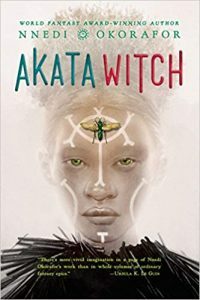 My fear in writing my introduction is that it may sound like Akata Witch is similar to another series of books about a young magic worker who did not know about his abilities and was embraced by a world he never knew about and how he found his place in that world with the help of some friends. I suppose if HP were an albino American-Igbo girl who continued to attend school with ordinary students then it would be exactly like that…which is to say that it is extremely unfair to compare the two and I really don’t want to do that. 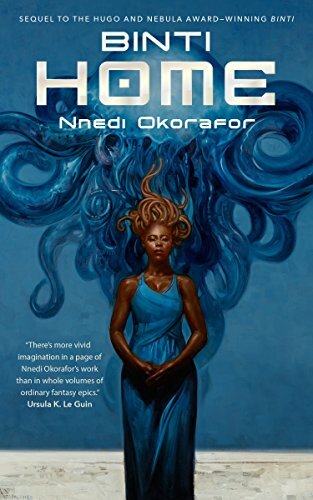 Nnedi Okorafor has made some magic with Akata Witch, and it stands on its own quite well. She has won the Locus, Hugo, Nebula, and World Fantasy awards for her fiction, and the sequel to this novel won this year’s award for Best Young Adult Book which was presented at the Hugo ceremony. Akata Witch could not have been written by someone unfamiliar with Nigeria. Whether the descriptions are of the feel of the air on skin, the sound of insects, the taste of the food, the smell of dust and smoke, Okorafor engages all of the reader’s senses in her book. Sunny’s albino skin is described by her school bullies as being the color of sour milk. The book simply delights on multiple levels. Okorafor is one of the leading voices of Africanfuturism, a growing genre of stories that features African voices telling African stories set in the future. This genre is long overdue. Africa gave birth to us all, and now is giving birth to some exciting literature that demands attention. Okorafor has a voice that is both African and American, born in Cincinnati and teaching in Chicago, but spending a lot of time in Nigeria as well. The blend of cultures, mixed with her intelligence and experience and scholarship, helps her create unique books which put extraordinary characters into extravagantly described worlds. Akata Witch features a young woman finding herself. African and American, “black” and albino, magical but living in an ordinary home and attending an ordinary school, Sunny Nwazue is a special protagonist. I loved this book, and I am excited to read the sequel. Binti is one of the most extraordinary students on earth, so special that she has been accepted to Oomza University, the best university in the galaxy. Adding to her uniqueness is her tribe, the Himba, a fairly insular people not known for their scientific prowess or for their desire to interact with any other people, either on Earth or from other planets. Few Himba ever leave their African homeland, and none have ever gone to Oomza Uni. 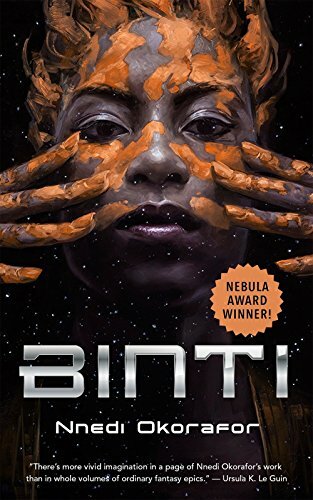 Defying the traditions of her people and the wishes of her family, Binti leaves her home before sunrise one morning, travels to the spaceport, and boards the ship. So begins an extraordinary journey fraught with danger, shocking twists, and a hero’s journey unlike any other. 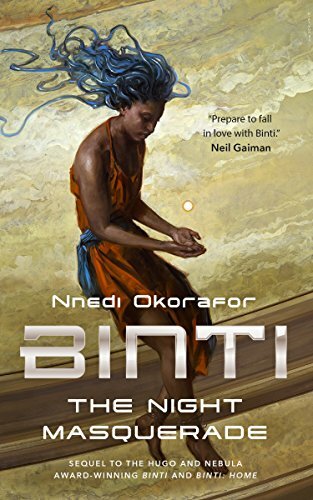 Nnedi Okorafor paints beautiful word pictures, and Binti is a special subject for those word pictures. Himba women paint themselves with clay from their desert home. The color, consistency, and composition of the clay are unique to the Himba homeland and the process of making it and wearing it identifies the wearer as Himba. When that clay is gone, what does that mean for Binti’s self-identity? A lesser writer might overlook or gloss over that transition. Okorafor puts it near the center of Binti’s journey. Does ojitze make Binti Himba? Or can Binti make the ojitze from the soil of another world? Ojitze features prominently through the books, and Binti’s relationship to the earth–and to the Earth–is metaphorically expressed through her use and making of the special clay. In her times of greatest distress, the clay grounds her, reminds her of who she is, connects her to her people and her planet. As long as she has ojitze, she is never fully alone. Even when she is the sole remaining human on a ship full of hostile intruders, the clay keeps her connected to her people. Later, when she has transitioned to a university student and erstwhile citizen of the galaxy, the clay reminds her of her home and her need to reconnect to her family and her tribe. The clay helps some species recognize her as a fellow citizen of the galaxy, yet at the same time separates her from other humans who see the ojitze as strange and other and primitive. Binti is a master harmonizer. Among the Himba people, her work creating astrolabes is respected and valued. Her gifts in mathematics let her make connections in the technology, creating devices that are beautiful and functional, bringing wealth and fame to her family. In space the harmonizing is much more challenging: harmonizing between species long at war. When she returns home, finding harmony is much more difficult than it once was. Binti has changed. Literally. Finding harmony between herself and her family, her people, her land, is more challenging than ever, especially when old enemies find new opportunities to make war. Okorafor was born in America of Igbo (Nigerian) parents. Her voice is unique. Fully African, fully grounded in the rich soil of a continent too often disparaged or ignored by a more Euro- and American-centric genre. Okorafor’s language is beautiful, her metaphors deep, and her characters brilliant. She may (or may not) be done with Binti, but I hope there are many more powerful African women coming from her wonderful imagination.